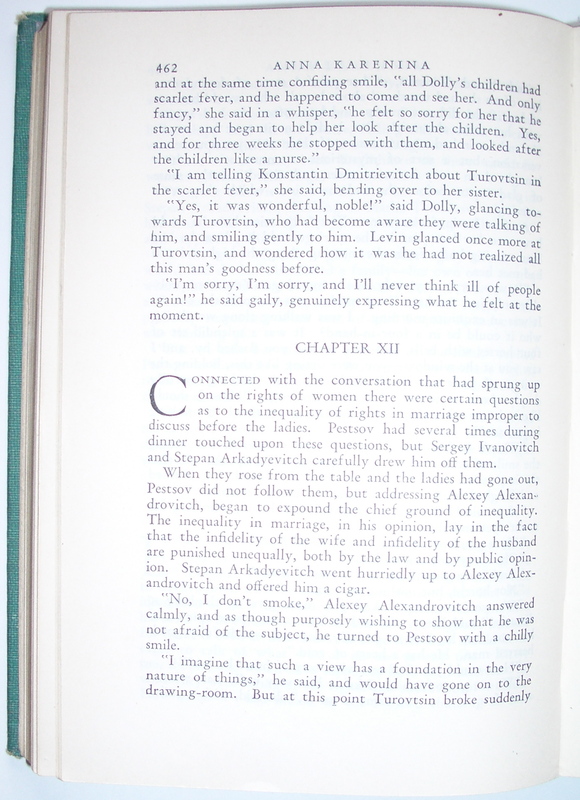 Here are two examples of the same part of Anna Karenina — Part 4, Chapter 12. If you click on the picture, you will see an enlarged version; hitting the back arrow will bring you back. The one on the left is the Heritage Club edition, first published in 1952. On the right is the old Modern Library edition. It doesn’t say when it was printed anywhere in the book, but it does tell me it was printed by Parkway Printing Company and bound by H. Wolff, so it must be from the fifties or earlier I think. The H. Wolff bindery had became part of American Book Stratford Press by the mid sixties. I don’t know who Parkway Printing Company was: Google disclosed one or two printers with this name, but I suspect this company is also gone. The Heritage Club provides an insert with all their books which tells you quite a bit of detail about the making of their books. This volume was typeset at Cambridge University Press (Cambridge, UK), using Monotype Ehrhardt, a face which sets tight, so is good for long manuscripts. First developed in 1938 it became popular during World War II when saving paper became an imperative. The design is by John Dreyfus, Typographical Advisor to the University Printer, Brooke Crutchley. The page is nicely balanced, with generous margins and decent spacing: both line spacing and word spacing. Monotype, where every character is a separate piece of metal, can be variably letter spaced too. Compare the running heads: The caps in both are letter spaced, but the “color” of the one on the left is consistent — it looks as if the spacing between all the letters is the same. But that’s actually an illusion: the spacing varies so that there’s more space between the I and the two Ns than there is between the A and the K and R of Karenina. The Modern Library does have equal spacing between all the characters, and looks much whiter at the start of Karenina than at the end. This same evenness of spacing can be seen in the Heritage text too. This doesn’t happen automatically: the compositor achieves it almost subconsciously when making up the line. Monotype is inherently more flexible than Linotype in this regard. With Linotype, when the keyboard operator nears the end of the line a bell warns him. He then inserts space bars sufficient to fill the measure and they are distributed evenly between all the words in the line. Look at the seventh line from the bottom of the right hand page where lots of space has been inserted between the words in order to avoid breaking “calmly”, a hard word to break well. The Heritage version doesn’t have lines like that, though if you measured them with a loupe with calibration you’d see that the word space does vary: you can’t force the words all to fit exactly into the same measure. But on this page the comp has achieved this without any word breaks. Of course he did have a 24 pica measure to work with, whereas the Linotype operator was working with 21 picas. The Modern Library version is set in Linotype Garamond, and is obviously a less elegant job. Random House did (and does) foster good design: their books carried a colophon which would often name the designer and give a little information on the typeface, but the Modern Library line was much more utilitarian and didn’t qualify for this sort of detail. The page isn’t awful, but it is more cramped and squat. Of course the trim size of the Modern Library does determine that the page shall be wide for its length. To me, there’s too little space below the running head. Adding the word Chapter to the chapter heading doesn’t add anything except clutter, and the drop initial is rather intrusive on a page this small. The Heritage page pivots nicely on the running head, the chapter number and the drop folio. The Modern Library version is set with less leading. Look at the end of the 3rd and 4th lines of Chapter XII where the descender of the p almost touches the ascender of the d below. 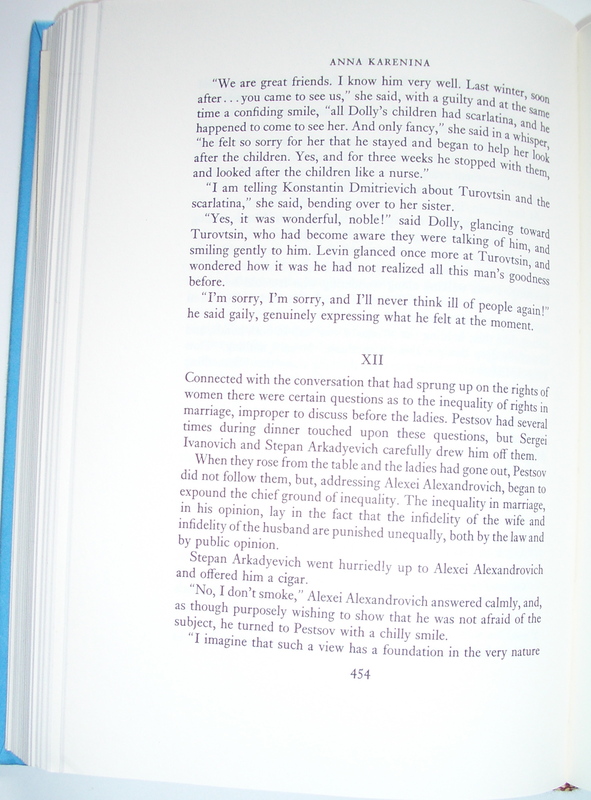 A contrasting situation can be seen in the first and second lines of the same chapter on the left. The Modern Library are fitting 41 lines on a full text page, whereas the Heritage one has only 36. Multiplying this by the measure shows us that they have almost the same amount of real estate available to them per page: The Modern Library edition has only 3 picas less per page. It is no surprise then to learn that the total page count of the two editions is almost the same: 935 as against 950, Heritage/Modern Library. The whole purpose of leading the lines is to facilitate the passage of the eye from the end of one line to the beginning of the next. This involves type size and measure as well. I don’t think any readers are going to have trouble with either of these pages though. None of this should be taken as criticism of Modern Library. They were trying to do something completely different, and the result works just fine. The Heritage Club is (probably) a reprint of the Limited Editions Club edition. Heritage Club books often (maybe always) are, and this one includes color illustrations from the original. That means the book was originally directed at a bibliophile audience, and that the budget was altogether different. Heritage books tend to have beautiful interiors and be let down by rather garish bindings. I keep thinking that when (if ever) I retire, I might rebind them into a decent plain case. The Strand has quite a good collection of Heritage Press books: if you want a nice edition of a classic, that’s a good place to go. My reason for showing them both side by side is really to explore whether “good design” makes any difference. We can certainly assume that more people have read the Modern Library version. Both use the same translation, by Constance Garnett, though the Heritage edition incorporates some “corrections”. While I am able to come up with reasons why the design of the Heritage edition is “better” than the Modern Library one, I really have difficulty in believing that this makes any difference to the reader. Perhaps a reader like me (i.e. someone who has worked at this stuff for years) may react favorably to the clean-ness, balance and restraint of John Dreyfus’s design, but does that affect their reaction to the novel? I suspect that good text design is something we in the business work for in order to impress our colleagues. It’s akin to speaking in grammatical sentences. You feel good about doing it, but people would understand you just as well if you spoke non-standard English. What people really want is the content of the book. The design shouldn’t erect any barriers — Stanley Morison said good design should be invisible — as distractions will only serve to make the reader’s comprehension and attention drop off. When you look at the text design of many bestsellers you have to acknowledge that good text design has nothing to do with the success of a book. Still we all aspire to the status of craftsmen, and making a well designed book has psychic rewards — even if the great design can’t be proved to translate into increased sales. Perhaps the best justification of design is the fairly defensive response recently given by a designer — inappropriate design can make the book look “wrong” and therefore less salable. Within the range of appropriate designs it probably matters less that the design should in itself be “good”, than that it should not be “wrong”. At the other extreme, Sukanta Chaudhuri tells us in The Metaphysics of Text (CUP, 2010) that “font and layout . . . are latent in the text from the moment of conception”. My reaction is total incredulity, but in a way one can see what he means: if the designer channels the author the format given to the book may approach some ideal form. But most enduring books come in various editions. Which of the above corresponds to Tolstoy’s vision? Neither presumably, if only for the trivial reason that he would have envisaged it in a Cyrillic alphabet.